One of the great misconceptions of our time is the belief that we can move away from fossil fuels if we make suitable choices on fuels. Venezuela seems to be the canary in the coal mine with respect to where oil exporters are headed. Other countries will want to push them out of oil production, so as to try to raise prices for themselves. What is right about the Peak Oil story, and what is misleading or wrong? Let’s look at a few of the pieces. Energy markets have been behaving in a very turbulent manner in the last couple of months. Almost everyone seems to believe that our energy problems are primarily oil-related. We have no guarantee of being able to preserve either the oil system or the electricity system. Have We Already Passed World Peak #Oil And World Peak #Coal? Energy is a subject that is greatly misunderstood. Provide view of future energy economics, and how space solar will fit in. Author of educational web site which offers a broad perspective on the challenges we are facing in energy, mineral extraction, food, population, climate, and financial areas, as we reach world limits. The focus of the site is on original research, particularly related to energy and the economy. Helped select and edit articles appearing on the energy website, The Oil Drum. Authored many articles under the name "Gail the Actuary." 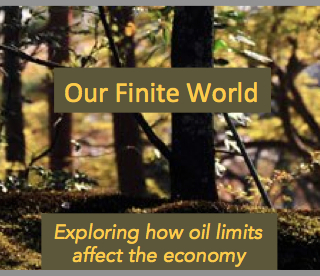 Exploring how oil limits affect the economy.